nerdy views: He's Back, And He's Old! The Daily Mail managed to get their hands on some on set pics from Terminator: Genesis, the "reboot" of the Terminator film franchise. 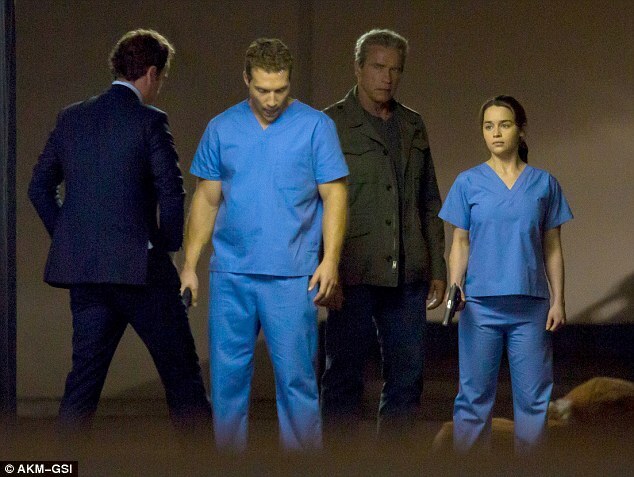 It stars Emilia Clarke from Game of Thrones as the new Sarah Connor and Jai Courtney from Spartacus & A Good Day to Die Hard as the new Kyle Reese. The film also stars Jason Clarke as the new John Connor, and Arnold Schwarzenegger who returns to the franchise as an aging Terminator. In an interview with MTV, Arnold explained why the Terminator looks older. Who knows where this movie will fit in the already convoluted Terminator timeline. Sarah & Kyle are both at a relatively young age. John Connor is being played by a 44 year old actor. And you have a grey haired Terminator in the mix. All signs point to some form of time travel within the movie that gets all of them together. The franchise is batting .500 with the last two which had no James Cameron involvement being pretty bad. Where is this one going to land? Terminator: Genesis is directed by Alan Taylor who has directed multiple episodes of Game of Thrones (no wonder Emilia Clarke was cast!) and Thor: The Dark World, and will hit theaters on July 1, 2015.